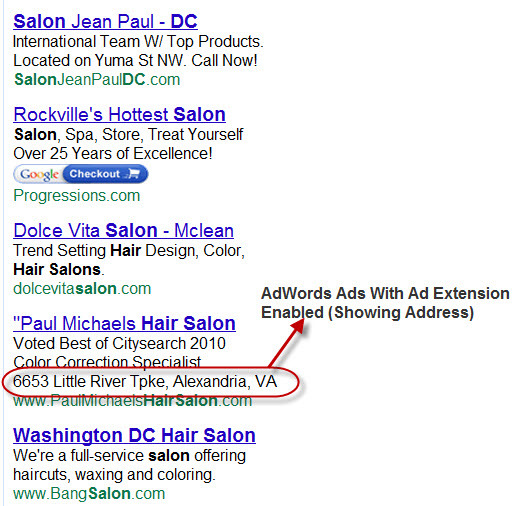 AdWords allows you to select which location your ads will be displayed. This is helpful if you want to show a different ad message in different locations or set different budgets by location (e.g. Webucator can show ads related to programming classes in Redmond, and ads for graphic design classes in the New York City area). Based on which Google search engine was used by the searcher (e.g. Google.com for USA and Google.ca for Canada). Based on the explicit geographic qualifier in the search query (e.g. restaurants in Syracuse). Based on searcher's web history (if enabled) or based on the previous searches made by the searcher. Based on the IP address of the searcher. Geo targeting will help you reach an audience with a unique message, thus allowing you to possibly increase your CTR and conversion rate in specific locations. Let's assume that we receive a good amount of traffic to our software programming pages from the Redmond and Seattle areas. Now we want to run a geo targeted ad campaign to promote our training services to this audience. Here is how you can target this audiences using geo targeted ad campaigns. 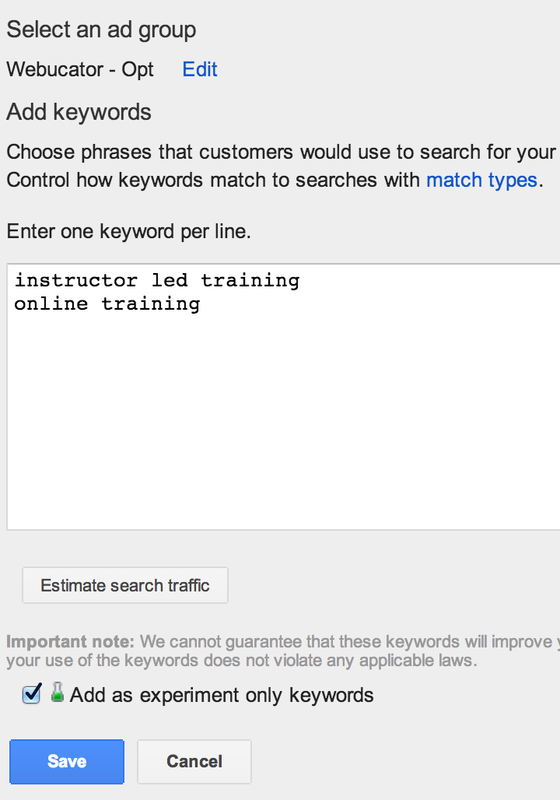 First, create separate campaign with qualifying keywords for ads that will bring people to software programming pages. While you are in this campaign, click on the Settings tab. Under the Locations section, click +LOCATIONS. 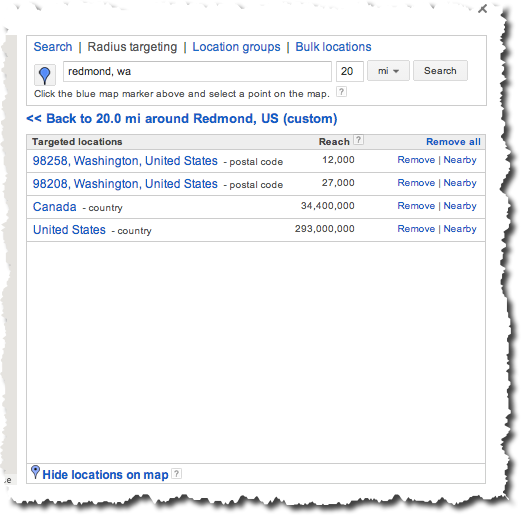 Click on the Search tab and type the zip codes associated with Redmond to locate these areas on the map. Follow the same steps to add Seattle in your list. Refer to the following screenshot. Click Save to include these areas in your campaign settings. In the above screenshot you can see that there are two custom regions around Redmond and Seattle. Select the campaign in which you want to enable this ad extension. From that campaign, click on the Ad Extension tab. You can simply extend your ads by using your Google Places account (refer to the Chapter on Google Places) or you can provide location information to Google by selecting 'Manually Entered Address' option as shown in the following screenshot. Click on the New Extension button. Provide the relevant information in the form. You can also upload an image with your business logo. Click save to add this ad extension to your campaign. Once you have saved addresses in your respective campaigns, Google will display your address in the text ads only when Google determines that the extended information will help the searcher find what they are looking for. Let's assume that we receive a good amount of traffic from Austin, TX and San Francisco, CA area for our web design courses. Create a geo targeted campaign for web design classes to cover these areas. Create a new campaign with qualifying keywords for ads that will bring people to web design classes. Click on the Search tab and type the zip code associated with Austin, TX, San Francisco, CA. How changes to your keywords affect the overall campaign performance (e.g. changes in impression, conversion, CTR, etc). What changes you will notice if you increase or decrease the bid amounts on some of the keywords? How your campaign will perform if you make changes to your ad groups? Navigate to the Campaign menu and then click on the Settings tab. Under the Advanced Settings, Select Experiment. Click the + Experiment settings Settings button. Provide a name for your experiment as well as a start and an end date. You can also manually start or stop an experiment. Select the Control/Experiment Split (50% option is commonly selected). It means 50% of overall activities in your campaign will be conducted using experimental values. Navigate to the Campaign menu and then click on the Keywords tab. Click the + KEYWORDS button. Select the ad group in which you would like to add new keywords. Enter new keywords as you normally would (e.g. instructor led training, online training, etc). 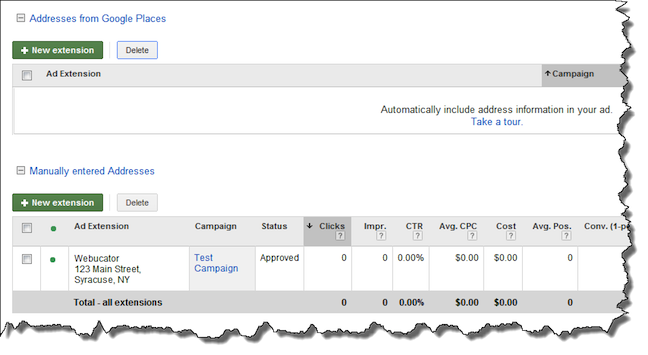 Click the check box that says Add as experiment only keywords. Click on Save. Your experimental keywords will have a different status icon which indicates that they live in an experimental world. 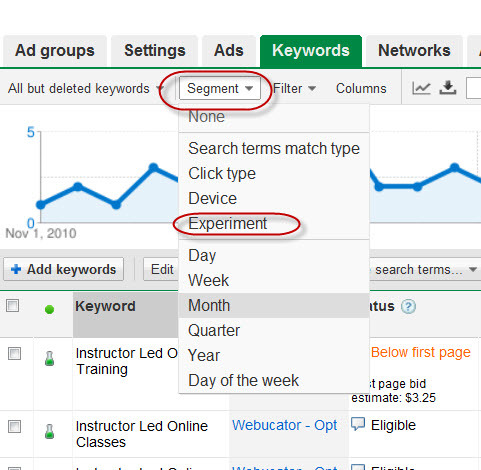 For the above example (keywords experiment), you will first navigate to the Keywords tab and then click on the Segment. Use the drop down menu and select Experiment. You will be able to see the segmented view which clearly separates your experimental parameters from your default items. Notice that your experiment row has a different status icon than the default items. Within the experiment row of keyword, make the changes you want (e.g. set the bid amount, etc). You can also take the keywords in and out from an experiment by clicking on the status icon and selecting either Control Only or Experiment Only. If you provided a start date and an end date in step 1, then your experiments will start and stop automatically. Here is how you manually start and stop an experiment. Navigate to the Campaigns tab and click on the Settings tab. Under the Advanced Settings, select Experiments. Click the Start Running Experiment button to activate your experiment. You can stop your experiment by clicking on Stop Experiment button. Once you stop your experiment you can click on the 'Apply: Launch changes fully' button to incorporate all the changes made during this experiment OR click on 'Delete: Remove changes' to discard the changes and revert back to the original settings. 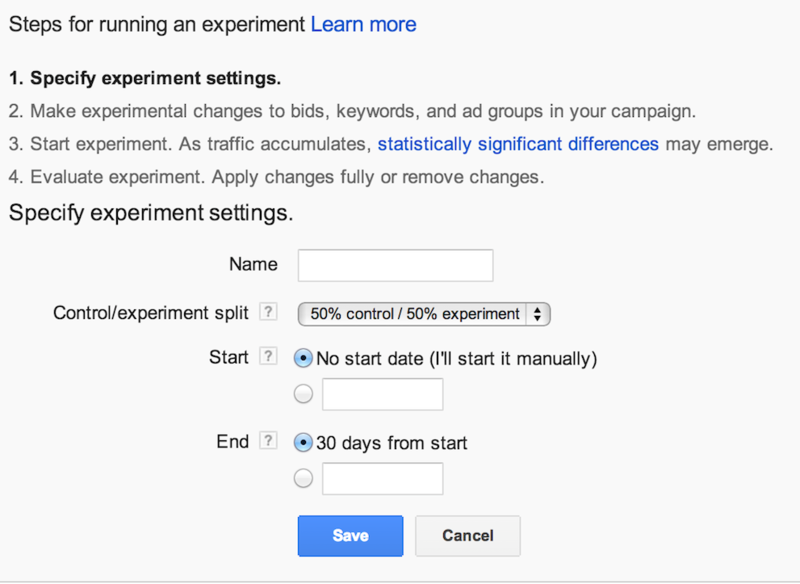 Google recommends running any Experiment for at least two weeks. However, the bottom line is that you need to run the experiment till you collect enough data to have statistically accurate data. Once your experiment produces statically significant data, Google will indicate that with an upward or downward arrow in that particular field. In the above screenshot you can see that the experiment did not make any significant difference in the number of Clicks (refer to the Clicks column in the screenshot). However, Impressions have significantly changed, which is indicated by an arrow symbol. Identify which keywords you should increase the bid on and which keywords to lower the bid amount to see significant changes in your Average CPC and Clicks metrics. 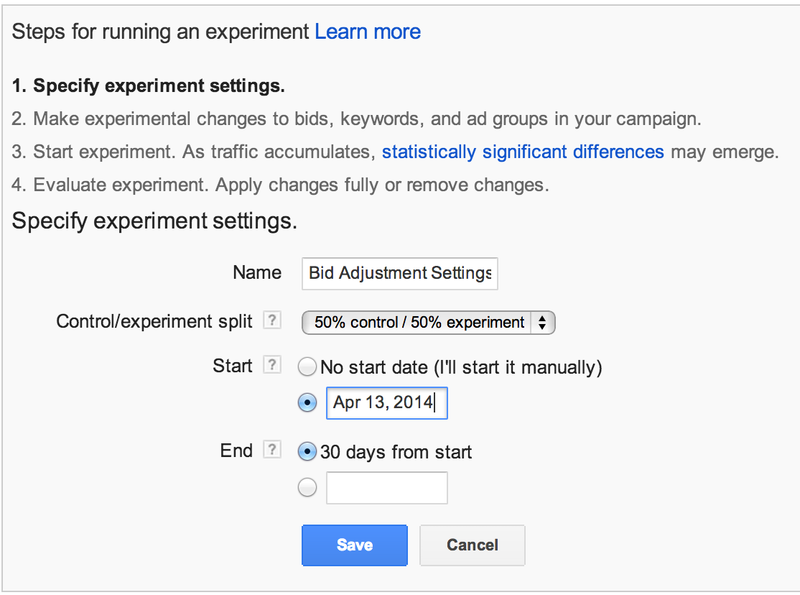 Setup a bidding experiment in which you can change bid amounts by lowering the bid for certain keywords and by increasing the bid amount for other keywords. Enable the experiment segmented view and within the experiment row make changes to the bid amount. 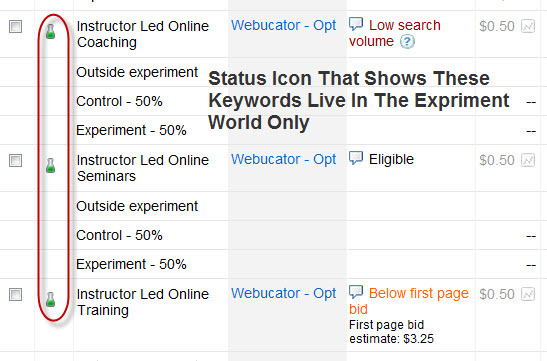 In the following screenshot, I am making a 25% increase in the bid amount for the 'webucator trainings' keyword. In this example we have selected a start date for this experiment and hence the experiment will run automatically. Monitor the changes in the Clicks and Avg. CPC column (for the keywords you are experimenting with). If you see the blue arrow symbol it means that Google has identified significant differences in these metrics.